The last episode of Will & Grace left us on somewhat of a cliffhanger regarding Grace and Noah's relationship, due to the discovery of his daughter. We'll see the fallout of that, plus an appearance from Marilyn, in this week's episode. Noah explains why he doesn't want Grace to meet his daughter, but Grace doesn't really listen and they end up getting in a big argument. She talks to Will and Karen about it, and he's able to convince her to agree to Noah's terms. She goes off to tell him, and Marilyn shows up to see Will. She tells him that his brother died. And by brother, she means her dog, Dr. Silly. He's angry for making him think his actual, human brother died, but she asks him to take part in his service anyway. Grace stops by Noah's to tell him about her change of heart, but she accidentally meets Katie instead and poses as a math tutor. Because this can't go badly. Grace fails at posing as a amth tutor, and Katie catches on. Grace admits that she's dating Noah, and Katie agrees to keep this visit a secret. Noah gets home before Grace can leave, and Grace ends up hiding in the closet. Despite Katie's objections, Noah opens the closet door to put his coat away, and finds Grace. 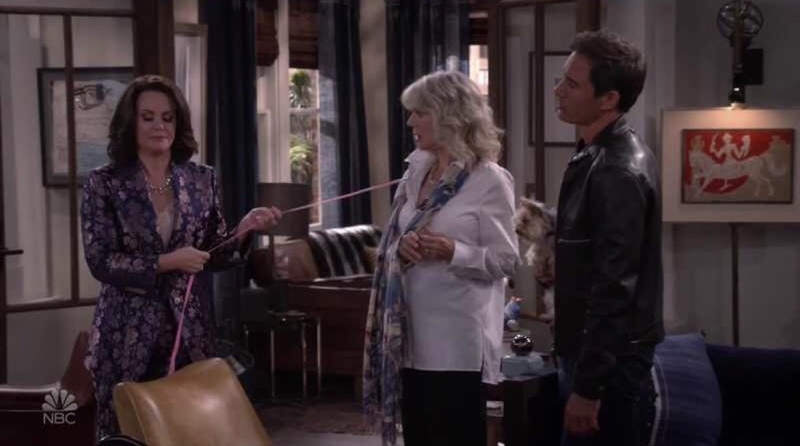 Meanwhile, will gets a new dog for Marilyn to make up for Dr. Silly's death, but she doesn't want it because Dr. Silly isn't replacable so quickly. She tells Will why Dr. Silly meant so much to her: after George's death, she didn't have anyone to turn to but Dr. Silly. Noah tells Grace that he didn't want her to meet Katie because she didn't want Katie to get hurt when they inevitably break up. This hurts Grace, because this relationship isn't worth it to her if there's no chance of them sticking together, and she breaks it off. Will apologizes to Marilyn for not being there for her, and promises to be there for her from now on. Also, Karen has fallen madly in love with the dog will got for Marilyn, and she keeps it, with no opposition from Marilyn. Later on, Noah shows up at the apartment to tell Grace they have a (small) chance, and they reconcile. This was Will & Grace's best episode of the season. While I've been disappointed with some of the episodes this season, this one was a true delight. Every storyline had some very funny moments, and both Will and Grace's had some touching aspects to them. Neither plot was overly dramatic or emotional though, which has been a problem for me this season. Jack's plot felt a little useless, but it did provide laughs, so I can forgive the fact that it was nothing but time filler. Will's plot had to have been my favorite, and not just because Karen was involved in it. Blythe Danner is always welcome on the show, and I was really happy to see her back. I wasn't expecting it, but I did appreciate it. Grace's plot, however, was also strong and I'm very glad that they didn't take the typical approach of just breaking up her and Noah. It would have just been a waste of our time.